The PDA Contact Group have guest written a post for us - if you are experiencing this with your child, please get in touch. 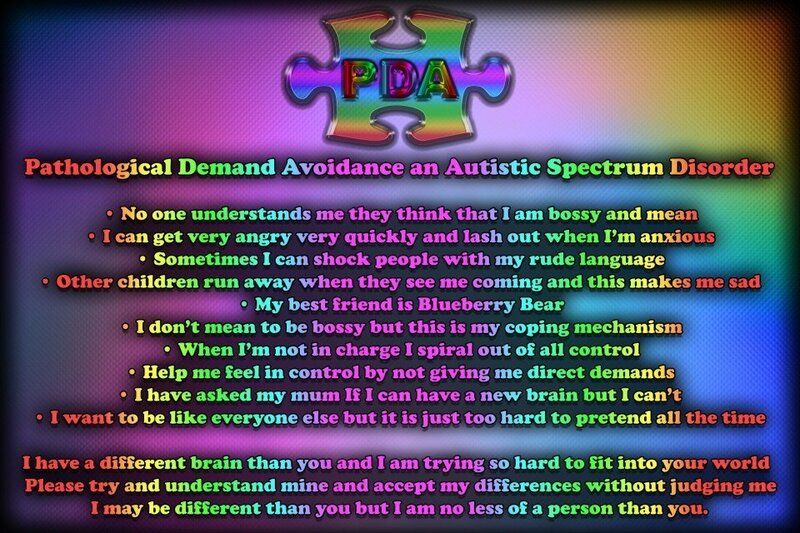 PDA is a very unknown, rarely spoken about and unrecognised ‘Autism Spectrum Disorder’. The condition was first recognised in the 1980’s by Professor Elizabeth Newson . PDA has always existed but it was Newson who first saw the striking similarities between these groups of children and proposed that there was sufficient evidence to warrant the inclusion of PDA as a separate sub group within the ‘Autism Spectrum’. If you would like to learn more about PDA please click on the link here below. It is vital that PDA becomes more recognised and diagnosed by clinicians the world over. Across the UK diagnosis of PDA is still very patchy because it is only recognised in a few Local Authorities. At the moment many children are described as having PDD-NOS (Pervasive Development Disorder Not Otherwise Specified), A Typical Autism or Asperger’s along with a host of co-morbid disorders including Personality Disorder, ADHD, ODD, Attachment disorder or simply referred to as just being naughty leading to parents being accused of poor and ineffective parenting. None of these currently used terms accurately describes or provides parents with the correct understanding or strategies that at PDA label does. One label, one diagnosis, one profile and one set of strategies and handling techniques, now doesn’t that make more sense than a montage of ill fitting ones? The National Autistic Society (NAS) and the AET both recognise PDA. It is about time that PDA is recognised throughout schools, practitioners, therapists and the wider community and by organisations such as NICE. The diagnosis of PDA provides parents with the correct profile for their children and sign posts them to the correct support groups and strategies. This is vital for the emotional well-being and long term prognosis for these individuals. A collection of ill fitting labels that are mashed together to try and describe the complexities of this child are unhelpful and do not provide parents with the correct sign post. Early diagnosis, recognition and intervention can lead to a much more successful outcome for these individuals. There is currently a huge surge from parents and a handful of professionals who are desperately campaigning to raise the awareness and profile of PDA. Recognition and numbers are growing and PDA is really beginning to snowball with more and more parents joining the PDA support groups and demanding the correct support, help and diagnosis from their local authorities. The time for change, recognition and respect for parents who do such a wonderful job raising their children, with next to no support from many of the professionals involved has arrived. The time for change is now and even if PDA is not in a diagnostic manual that doesn’t prevent any one who is a professional from researching the information that is available, having an open mind and seriously considering if any of children that you come into contact with would benefit from the diagnosis and strategies that PDA offers. The following Resource page, very kindly compiled by Graeme Storey, is a one stop shop for everything that you need to know about PDA. If you are the parent of an ASD child who just doesn’t appear to be typical of an ASD presentation, the parent of a child with extremely challenging behaviour or if you are a professional that is willing to be open- minded and explore the concept of PDA then please click through to this link. You will not regret it and with an open mind you could transform lives. The parents and children that follow in my footsteps must not go through the hell and turmoil that Mollie and I have experienced on our journey. The PDA Contact Group is our flagship forum and group but they desperately need funds to become a registered charity. When they become a registered charity they will be able to apply for much needed grants and funding. Long term we are hoping that the PDA Contact Group will be able to update their website, grow and evolve in line with the increasing amount of members and awareness, provide parents and professionals with more support and information and eventually become, to families affected by PDA, what the National Autistic Society is to families affected by Classic Autism or Asperger’s. Please show your support to the PDA Contact Forum by making a small donation, details can be found here. Labels: Love or Loathe them? Thank you so much Special Needs Jungle for us allowing us to be a guest blog. It is very much appreciated and you have done a wonderful job. So sorry about such short notice. My son has PDA and no one has heard of it. We wouldnt have got the diagnosis if we had never met Janet Muscutt, Ed psyche in Salford. because of janet we got to go to the ElizabethbNewson Centre, which was a great help. He will be 16 soon and has learnt to cope with it but it still impacts on his life. He tried to explain it to a friend recently. He also has Aspergers Syndrome so its a double whammy. He hates both and refers to them as his curses.